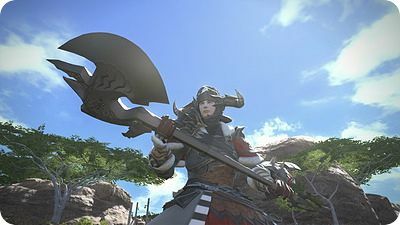 The Marauder is a unique and interesting class in Final Fantasy XIV: A Realm Reborn in that it’s a tank but doesn’t play like one. If you just need one clear sentence for what the Marauder is, it is simply “a tank that plays like a DPS.” That means that damage mitigation is high and DPS is moderate and the class is perfect for those who don’t like to play risky . If you’re wondering what the Marauder is, it can be difficult to describe because it’s something a bit different than normal MMO tanks. Mostly because it plays fluidly like a DPS class. There is very little in the way of active mitigation. There is no shield block, most mitigation comes passively or through the various skills you’d naturally use . You’d want to play a Marauder if you’re interested in tanking but not being a tank. You’d want to play a Marauder if you don’t mind doing less damage than other classes but living longer and being a bit heartier. A good analogy is that Marauder is a great class if you want to attack enemies and not worry so much about dying, but take a bit longer to kill them. I do feel like the first cross class skill you should obtain is definitely Protect. The extra damage mitigation makes soloing a lot easier and it costs nothing mana wise. It’s also super easy to obtain. That’s my first and biggest suggestion. Beyond that, skills from the Lancer are the best. Feint is a slow and Invigorate can fill up your TP bar at lower levels. Blood for Blood is an interesting skill while soloing, since it increases damage by 20%. Gladiator is where all the good tanking skills come from, especially Flash which will taunt all nearby enemies and Provoke for a single enemy. Well, Blacksmithing / Mining is a good combo to work on first to craft new weapons. Armorer crafts new armors for the Marauder. That’s pretty much it on the crafting front. You’re not looked into any one profession and I’d highly suggest resorting to the auction house for lower level gear rather than spend time and/or money worrying about crafting early on. Materia for the Marauder is rather simple. Focus primarily on Vit followed by Str. So Vitality and Strength Materia are pretty much the only ones you need. Party / Critical Strike / Determination (Battledance / Savage Aim / Savage Might) are all useful as well. The way stats work is simple. Vitality equals your health which equals your damage mitigation. Marauders tank by basically bash their head into things and soaking up damage, relying on life leech and healers to fix the issue. So the more health you have, the better off you are. The same is true of Warriors to some extent, but you get the picture. Strength determines your damage. Pure and simple so far right. Dexterity covers parry rates. It’s better than nothing. Heavy Swing (lvl 1): Heavy swing is your first basic attack. You’ll use it throughout as it’s your combo opener. Foresight (lvl 2): 20% damage reduction for 20 seconds. You’ll use this while tanking. Skull Sunder (Level 4): The second part of the combo with Heavy Swing. Packs a strong punch as a followup. Fracture (lvl 6): Adds a dot, use this for additional damage. Bloodbath (lvl 8): Converts 25% of your damage into healing, useful while tanking and while soloing and fighting tough mobs. Brutal Swing (lvl 10): It’s a stun that’s super useful for stopping spell casting. Overpower(lvl 12): It’s your AoE taunt, basically. When fighting three or more enemies, you can spam Overpower for large amounts of damage / threat. Tomahawk (lvl 15): Your first ranged attack. Use it to pull. Comes from a level 15 class quest. Maim (lvl 18): Combo after Heavy Swing. Increases damage by 20% for 18 seconds. Berserk (lvl 22): Increases attack power by 50% for 15 seconds. After the 15 seconds you can’t use weapon skills anymore. This is a kind of interesting ability because it locks your weapon skills for 5 seconds, but gives you 50% more damage for 15 seconds which means you’ll do more total damage, but you’ll lose a bit of control for 5 seconds. This is best used situationally for when you need something dead, fast, or when you’re in a safe spot while tanking. Mercy Stroke (lvl 26): This is a finisher that deals a ton of damage if a target is below 20%. Use it frequently. If you finish an enemy with this skill, you’ll gain 20% of your health back. Super useful when fighting ton of weak enemies at once and you can finish one off to get a quick heal. Thrill of Battle (lvl 34): Increases maximum HP by 10% and restores the amount increased. So, what this does is it gives you essentially a 10% heal that’s also additional health. While soloing it’s not that great of an ability and it’s locked into MRD / WAR, so you can’t use it on other classes, but while fighting at higher level dungeons you’ll use it a lot in those moments where you really need just a bit more health. Storm’s Path (lvl 38): 50% of the damage done is healed as health, but it’s a combo after Maim. This is sort of a situational skill because it’s the third skill in a combo that involves Maim (which isn’t as much damage as Skull Sunder). However, if used properly, you can heal yourself a good bit especially if Bloodbath is up. Vengeance (lvl 46): For 15 seconds you’ll auto attack with a mild attack. It’s useful when you have a ton of enemies beating on you to do AoE and keep threat up on them, but otherwise you can spam it whenever for extra damage. Storm’s Tip (lvl 50): This is an intersting ability, it follows Maim and deals a TON of damage when it hits. It also decreases slashing resistance (more damage) and stops recovery via curing magic by 50%. A great PvP skill and an even better skill in dungeons to deal with situations when you’re fighting double healers. Traits give you a bonus for playing and using the selected classes abilities. The biggest trait is Enhanced Vitality. Comes in three flavors and gives you an extra 12 VIT in total which can help compensate for racial selection. The following skills are enhanced: Foresight, Bloodbath, Fracture, Brutal Swing, Berserk, Mercy Stroke, Thrill of Battle, and Maim. These are for Marauder only. While soloing you’re going to want to take caution of a few things. First, while you’re very hearty, your damage isn’t anything at all like a Lancer. So you’re going to be a slight disadvantage on speed. However, when it comes to FATEs you’re more than qualified to actually tank the enemy and save the day. For someone, that’s mostly what he did was focus on tanking FATEs and grinding away at enemies. A lot of your actions don’t shine during solo play because you won’t get close to dying except when you have a couple of enemies on you and even then that’s more of an accident then on purpose. You’ll usually want to take most things one enemy at a time. Since a lot of your abilities cause enmity (effectively taunting) you’ll want to be a bit careful with Overpower when a lot of enemies are around. You’ll draw their attention rather easily and be in a situation where you’re tanking other’s enemies. That’s pretty much it, there isn’t much other than unleashing your combo on an enemy, waiting for it to die, then rinse and repeat. There didn’t find anything special while leveling Marauder other than the ease in which you’ll survive. Dungeons are a different, because instead of focusing on doing a little bit of DPS, you switch over to focusing on staying alive and keeping enemies off of your teammates. It’s a difficult task, no doubt, but someone has to do it. The first thing to understand is that a lot of your skills cause threat, so you don’t necessarily have to worry about taunting. You just have to run up to enemies and hit them in the face with your axe. First is picking the right actions / skills for the right scenario. If you’re just fighting a single enemy then you’re going to want to just follow through with your normal combo. If you’re fighting two or more enemies you’ll need to juggle threat a bit differently and attack both somewhat equally. The one being focused by the group should take priority but you should use your combo on the second enemy often to make sure it stays fixed to you. When there are three or more enemies you’ll want to take a look at using Overpower. It costs a ton of TP to spam, but it lets you keep the attention of multiple enemies really well. It gets more and more effective the more enemies there are. Warrior is the job associated with the Marauder and requires level 30 Marauder and level 15 Gladiator. Return to the Marauders guild to do a simple quest to unlock the job. The Marauder is very tanky while the Warrior is a bit of both. Warriors use a Wrath system where they can use Defiance to switch into a tank mode (25% more health 35% less damage). Every time you use certain skills you’ll gain a point of Wrath which increases critical strike damage by 2%. When you have five units stacked you become infuriated which allows you to activate other skills. Warriors inherit all Marauder traits and level up alongside the Marauder. Defiance (lvl 30): As described above, Defiance gives you 25% more health and 35% less damage, but every time you use one of your weapon skills (except Heavy Swing) and skills like Beserk you’ll gain 1 Wrath, which increases critical strike damage by 2%. 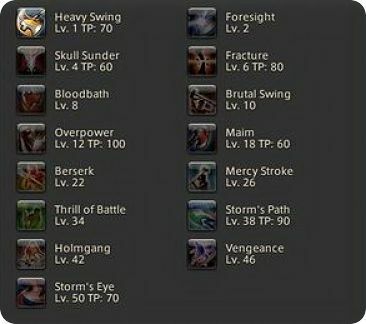 After 5 stacks of Wrath you become Infuriated, which gives access to the skills below. Once using the skill the Wrath is consumed and things begin again. You can switch Defiance on/off. Inner Beast (lvl 35): A strong attack that bypasses the Defiance damage penalty. Can only be used when Infuriated. Unchained(lvl 40): It gives you 20 seconds without the damage penalty. Can only be activated when Infuriated. Steel Cyclone (lvl 45): Strong AoE attack, requires Infuriated. Infuriated (lvl 50): Instantly makes you Infuriated. Vitality is once again the major winner, but Strength is important too. Even with the damage penalty, Warriors do some strong burst damage. So it’s not unreasonable to mix and match Vit / Str. Gladiator and Puglist skills only. Marauders only use Axes. It’s kind of boring, I know, but they’re the only axe wielding class. One thing to note is that while Marauders are all about face tanking, they cannot take heavy hits like a Gladiator. The second you see an enemy casting, move out of its area of effect as soon as possible. It’ll help you a ton while tanking. Don’t stand in the fire is critical.